After finding my wedding dress inspiration and choosing my patterns, it was (finally!) time to test it all out on my first muslin! As someone who came of age during reality TV, I was admittedly a little bummed that I wouldn't have my "Say Yes to the Dress" moment. You know, where you try on dozens of pretty dresses until you find "the one." You know it's "the one" because you will instantly tear up, and everyone in your party will stare at you in open-mouthed amazement until your mother whispers, "It's the one." 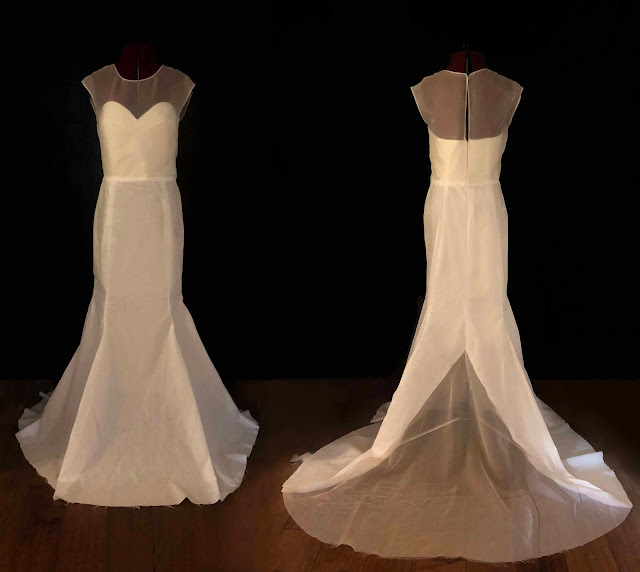 Yeah... sewing your own wedding dress is more like trying on a muslin made from an old bed sheet with fifty pins in it, standing in the dark hallway in front of the mirror craning your neck to see if it's pulling at the back. There will be no happy tears or bated breath in your first fitting. Or at least that's how it was for me. But that's not to say it wasn't any less exciting. I was mostly excited to sew up a muslin to see if this was a design that would work on me. 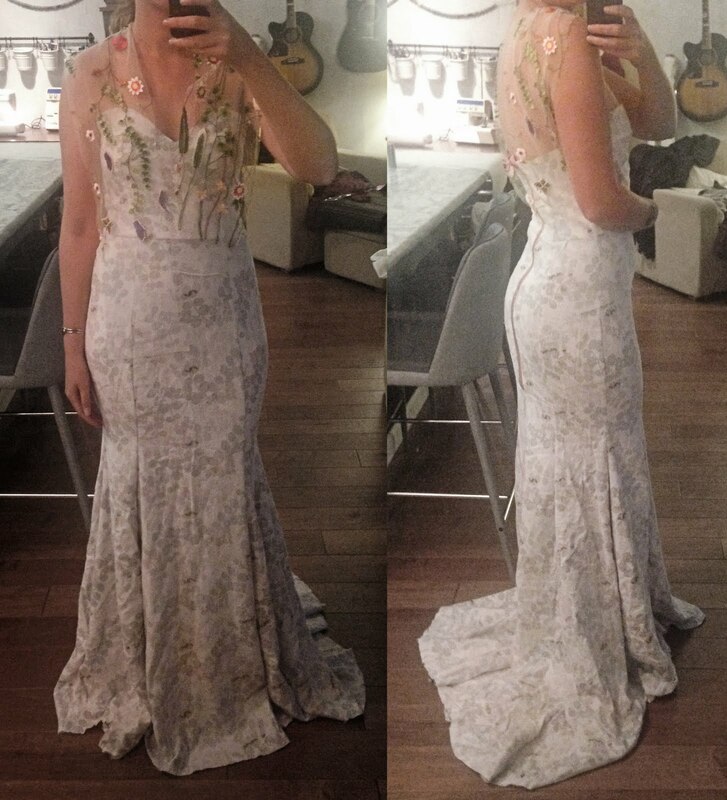 I don't think I've ever sewn a long formal dress before, and couldn't wait to see how the shape would look. Similar to trying on dresses in a store, I wanted to see if the trumpet shape I was so fond of would actually look good on me. (Side note: my friend's mom was horrified to hear that I hadn't even tried on any store-bought dresses before jumping in.) After months of dreaming, it was finally time to see if it would actually work! I sewed up my McCall's 7320 pattern first. Although I had bought a few patterns, this one really did have all the features I was interested in - trumpet skirt, sweetheart neckline, and train. Plus there were only four main pattern pieces! I graded between sizes (I'm an 8-12-14), traced everything out onto an old bed sheet, and quickly sewed it all together. Overall, I am quite pleased with the initial direction of the dress. It accentuates my curves nicely (who says pear shapes can't wear trumpet dresses? ), will look pretty with the tulle, and is fun to swan around in. But I do have some indecision over the three different fits for the skirt. 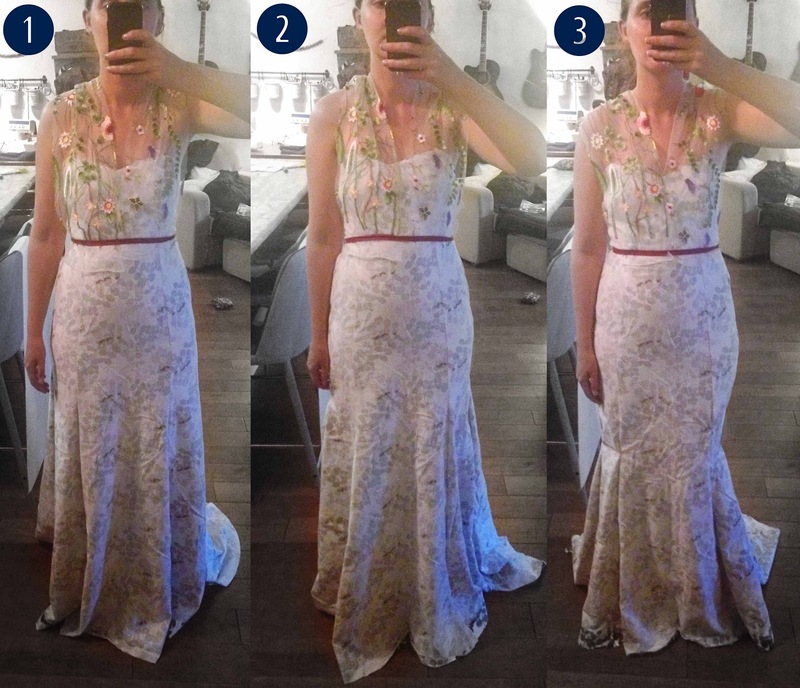 The first photo above is the dress as drafted. It is less fitted than the pattern cover, but I actually like how flowy it feels. The third dress on the right is a more fitted trumpet shape, which was my original plan going in. And the middle dress is somewhere between the two - fitted through the hips and then flowy below. Currently, I am liking the middle one the best. It seems like a happy medium between the two. I'm a little surprised by this because I was thinking I'd go for the more extreme trumpet shape. To check my pulse, I pulled up my inspiration looks again to compare, and number 2 is very similar to a dress I had seen in the display window of a bridal shop when we were staying in Berlin shortly after we got engaged (the red dress pictured at right). It has a nice drape and shape without being too fitted. So it's that direction for now. 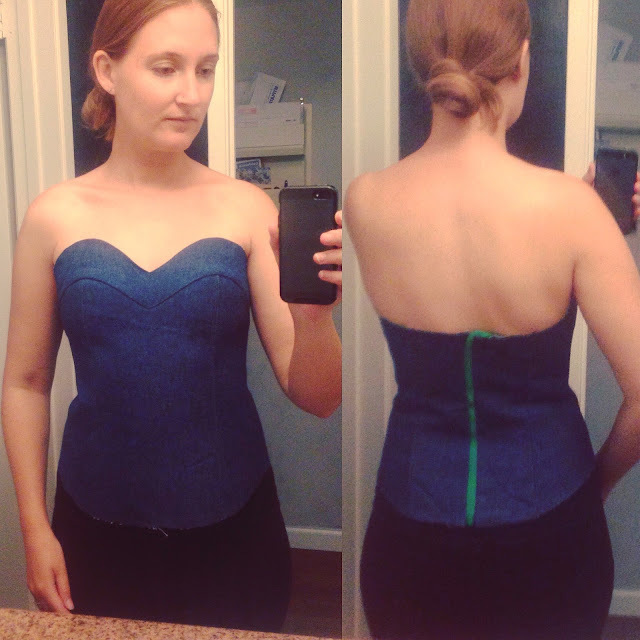 Around the same time, I also started fitting my corset pattern. I had ordered Ralph Pink's Bella Corset and was planning on using it as the internal structure and bust support for the garment. The first muslin sewed up beautifully in a rigid denim (to simulate the boning without actually inserting any). I did a major swayback and reduced the bust slightly over two more muslins and achieved a pretty excellent fit. Without the boning or even a laced back, the shape was really very flattering. However, I then decided to alter the pattern to include bust cups for more support like a real bra. I honestly didn't really know what I was doing but was having fun experimenting. With the help of Orange Lingerie's Esplanade Bra pattern, I made about three or four more muslins in an attempt to insert bust cups. The corset wasn't a total failure, however. I decided to swap out the McCall's bodice for the Ralph Pink corset because of its excellent shaping and more pronounced neckline. So it was off to make another complete muslin combining the two patterns into my final look - the skirt of McCall's 7320 with the bodice of the Bella Corset. For the non-sewists it was hard to tell quite how the dress was shaping up, but for me it was all I needed to have my "Say Yes" moment. Full steam ahead! With six months to go before the wedding, I decided to sew up one last muslin in a white fabric to practice my techniques and check the fit one more time. And I was glad I did! Apparently, the flannel sheet I'd been using for my first few muslins had some give to it (d'oh!). Made up in a more tightly woven fabric, the dress was now a bit snug. Enter more fitting, more pattern adjustments, and more muslining. Luckily I had bought a lot of muslin in addition to the old bedsheets! You'll notice that I added a few more elements from the first muslins. I finally got around to drafting the sheer overlay. In the muslin it is cut from an unused sheer curtain, but on the final version it will be replaced with the beaded, embroidered tulle from my inspiration picture. I also wanted to add the tulle to the skirt, but couldn't quite work out how it would be attached. After much meditation, I finally decided to insert a godet in the back along the train. The sheer train added a playful element and also meant I wouldn't have to stitch the tulle over the satin skirt. Isn't she fun? After a few months of playing with the style and fit, I am immensely satisfied to see it all come together. All that is left to do is to *gulp* cut into the good stuff and start sewing. it looks fantastic. and SO much work. also I admire your persistence, fitting a dress like that by yourself is really difficult and you nailed it. Can't wait to see the finished dress. Thank you, Beth, you have been my cheerleader throughout! wow wow wow!!!!! You did so much work and it all has paid off. I'm glad you swapped the bodice because it was 'very nice' and now it is 'amazing'!! What a fun and exciting journey for you!!! What a beautiful dress. I cannot wait to see the final product. I love how detailed your fitting process has been. May non-sewists have no idea of the planning, fitting, and artistry that goes into a couture dress. Right?! I think half the time was just spent on designing and fitting! Thank you, Helen! The sitting part is definitely an important point - it didn’t go so well on some of my muslins. Ha! I think the third skirt is more mermaid territory than trumpet actually. I like your choice. Wow! I’ve not constructed such an intricate garment, so I’m in awe. It’s going to be fabulous! I liked the style lines of the middle dress much more, too, so I was happy you chose that one! Excited to see the final dress! That denim corset is amazing! I hope you finished it for your regular wardrobe. I love that wide band/facing it has. Can't wait to see your final dress.